As associate editor at Family Business Review (FBR), I have received and managed many manuscripts based on qualitative research methods. In the past 5 years (2009-2013), almost 15% of articles published in FBR were based on qualitative methods. With FBR’s acceptance rate of about 10%, this means that we have received and processed a great deal more qualitative submissions in total. My experience is that the quality of these manuscripts varies widely. When improvement is needed, I find that there are a number of common strategies I consistently suggest to authors in my editorial letters. This editorial article is primarily designed to combine these suggestions into one document. 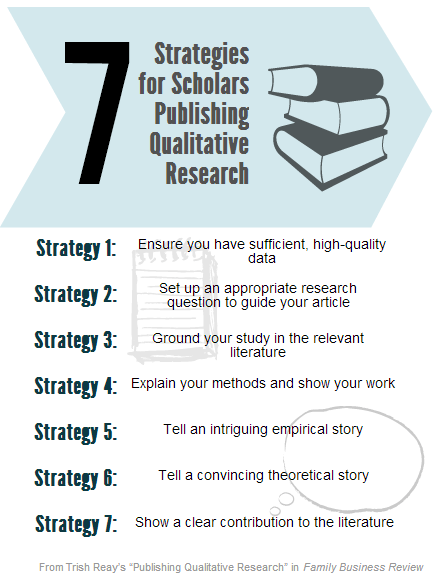 In addition, I asked a few others for their suggestions about how to publish qualitative research. In response to my request, I received excellent feedback from a number of FBR associate editors, reviewers, and authors who have experience with qualitative methods. I thank them all! Click here to read the entire editorial. This post by Cynthia Navalenko first appeared at the Management INK blog and later at Social Science Space.